South Australian Railways Pullman Dining Car Adelaide was imported to South Australia during May 1928 at a cost of £20,215 9s 1d and was placed into service on the South Australian Railways on 19th May, 1928. Two days later, i.e., on 21st May, 1928, it was first operated on the "Melbourne Express" between Adelaide and Serviceton, providing a dinner service to passengers at a charge of 5 shillings on the down journey and breakfast to Adelaide bound passengers for which 3 shillings was charged. The car was unloaded at Port Adelaide, together with sleeping car Mt Lofty, on 30th April 1928, after being shipped aboard the Port Nicholson from New York. It had been shipped to New York, by rail, from the Pullman Carriage Company of Chicago in the United States of America. A test run was made with Adelaide to Murray Bridge on 16th May 1928, which coincided with the 50th birthday of the South Australian Railways Commissioner, Mr W.A. Weeb, who accompanied a group of invited guests on the run. The car entered regular service on the "Melbourne Express" on 21st May 1928, on the 4:30pm train out of Adelaide. In normal service the car only ran as far as Serviceton, where it was taken off and attached to the Adelaide bound "Melbourne Express". An exception to this routine was made during its first week of operation when it ran through to Melbourne for inspection by the Victorian Railways officials. The car is 82 feet, 4 inches long and weights 76 tons. The floor utilises a heavy steel underframe and reinforced concrete slab that helps smooth the ride of the two six-wheeled bogies. The dining compartment is 38 feet long and seats 48 diners at tables made of walnut with chairs constructed from mahogany. The Adelaide remained on the Adelaide-Melbourne run until the arrival of No.240 Melbourne Express on 1st August, 1930; from that date it was decided to discontinue the running of the dining car owing to the falling off of passenger traffic. When the schedules of the express trains between Adelaide and Melbourne and vice versa were altered, commencing 13th May, 1935, the dining car service on the South Australian side was reinstated. Dinner was provided for passengers on the down journey between Adelaide and Murray Bridge, and breakfast on the up journey. The Adelaide was detached from the down express at Tailem Bend and attached to the up express at that station next morning. On account of the accelerated train services between Perth and Melbourne, adjustments of the train schedules of The Overland (the renamed "Melbourne Express") were necessary, and from 6th June, 1938, the departure time of the express from Adelaide to Melbourne was altered from 6:35pm to 7:30pm and the arrival time in Adelaide from 9am to 8:25am. In view of these altered timeings it was considered that it would be unremunerative to continue the use of the dining car on either forward or return journey and the dining car service on The Overland was discontinued from that date. Over the ensuing 25 years until Adelaide was used on the East-West Express on 23rd July, 1963, it was used only spasmodically on Departmental and Parliamentary special trains to the south-east, Terowie and Port Pirie; also was employed on several A.R.H.S. special guaranteed trains. It was necessary to use the Adelaide on the Adelaide to Port Pirie Junction train because the Cafeteria car was temporarily out of service. It was transferred to the ownership of State Transport Authority of South Australia during the 1975 transfer of country rail to the Commonwealth. When not in service, the State Transport Authority stored the carriage in the North Car Shed of the Adelaide Rail Yard. On 6th September 1988 dining car Adelaide was transferred to the "Port Dock Station Railway Museum". 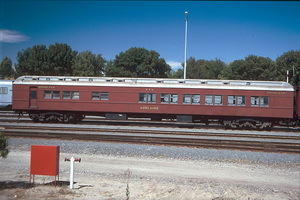 The car is considered to be historical unique as it is possibly the only remaining example, in the world, of a Pullman dining car in original "as-built" condition with wood stoves, ice-chests, original interior paint work and fittings. See also: Macedon and Mount Lofty. 19.5.1928 Entered service on the South Australian Railways named Adelaide. 21.5.1928 Ran first service on the "Melbourne Express". 1.8.1930 Withdrawn from service on the Adelaide to Melbourne service. 13.5.1935 Reinstated on the Adelaide to Murray Bridge section of The Overland service. 6.6.1938 Withdrawn from The Overland service. 6.9.1988 Transferred to the "Port Dock Station Railway Museum".